High temperature heat pump for heat recovery with wide application temperature range. With stable frame construction and flexible outputs. Double high-absorption suspension with sylomer pads and adjustable feet base plates ensure low noise and vibration levels of the hermetic SCROLL compressor. Stainless steel plate heat exchanger (1.4401) for heating circuit. Stainless plate plate heat exchanger (1.4401) for source circuit. Electrical switchboard with integrated safety elements and equithermal controller of the heat pump is located under the upper lid. With electronic starter via built-in soft starter and electronic expansion valve control with autoadaptivity. Frame construction with a massive base plate on adjustable legs. Covering the epoxy-coated unit. The multi-layer sound insulation and vibration-eliminating profiles are glued from the inside of the cover. Equithermal, digital control of the heat pump with integrated cooling control function (passive cooling). For controlling one heating circuit with mixing unit, for one heating circuit without a mixing unit. Using the cooling function (passive cooling) and the cooling circuit with mixing unit. 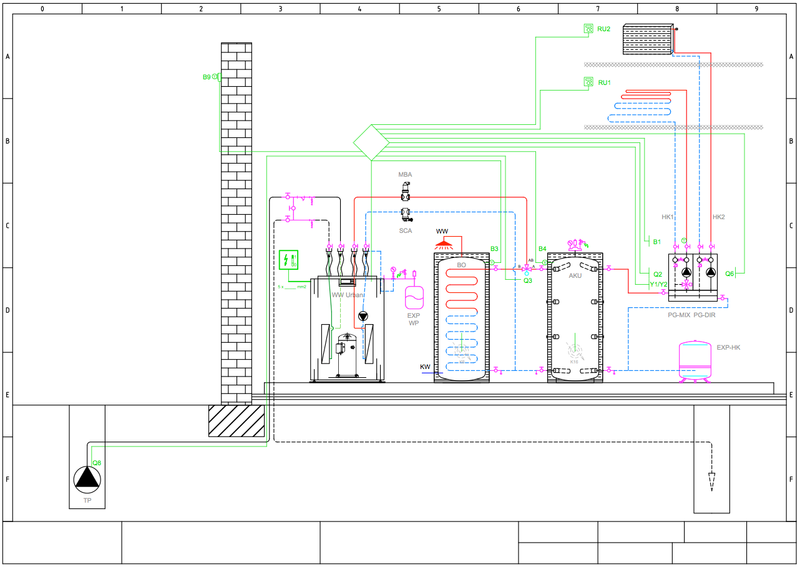 Temperature regulation for DHW storage tank and control of electrical auxiliary heating. Simple extension of control up to 3 heating / cooling circuits via expansion modules or up to 16 circuits via system controllers. The standard version also includes solar control as well as the possibility of cascading up to 16 devices. Full-text control menu with features dependent on user instructions, information texts and status output signal. Diagnostic system with record history of operation. External temperature sensor, hotgas sensor, liquid refrigerant temperature sensor, heat pump flow and return temperature sensor as well as source output sensor, source return sensor, and hot water sensor. Connection port size [ " ] 1.1/2" 2"